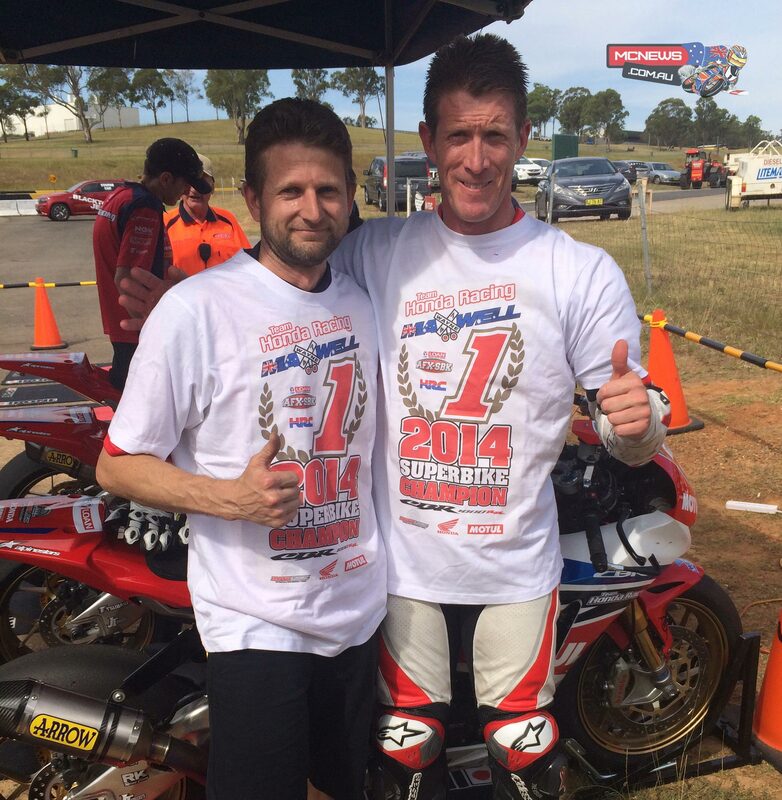 Team Honda Racing pilot Wayne Maxwell has comfortably taken out the 2014 YMF Loan Yamaha Australian FX Superbike Championship at Eastern Creek. Maxwell wrapped up the title after two of the scheduled three races for the day – his sixth and fourth place finishes enough to secure the title heading into the final race. Teammate Troy Herfoss would have been disappointed with his day on the track, and despite some issues throughout the day (he claimed fifth, 10th and fourth from his three races) managed to finish the championship in second. An inspired day of racing from Mike Jones (Crazy Dog Kawasaki) handed him third place in the overall championship – a debut race win in the class, together with a second and sixth Aiden Wagner (Wagner Soil Testing) enough to get him a podium spot. 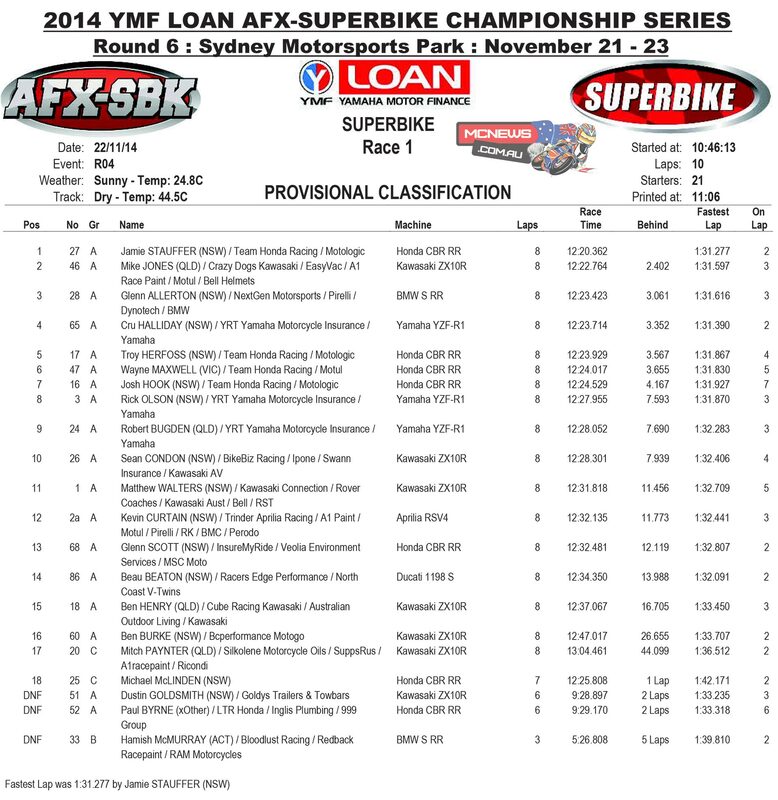 Robert Bugden (YRT) and Glenn Scott (Insure My Ride) rounded out the top-five in the overall standings. 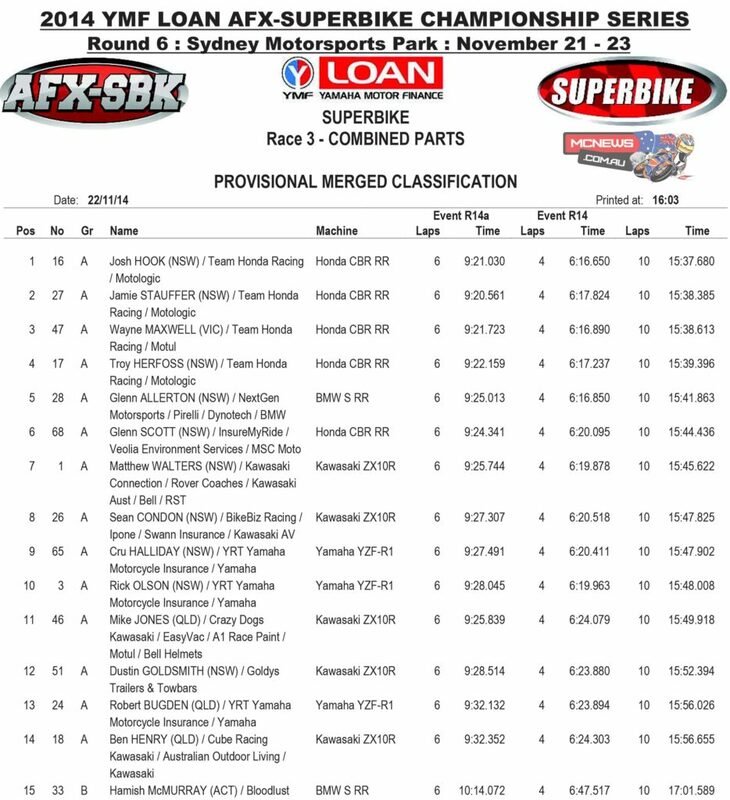 In the opening Superbike race of the day, Jamie Staufer (Team Honda Racing) took the lead from pole-position, while Cru Halliday (YRT) moved into second place and Glenn Allerton (NextGen Motorsports) worked his way into fourth. 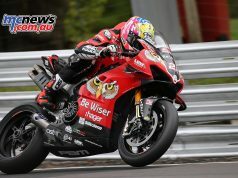 Series leader Maxwell settled into sixth position off the start, with all eyes planted on the challenge to team Honda from the other riders. At the end of the opening lap, Allerton put a huge pass on Herfoss coming down the straight to move into third place, while ahead of him Stauffer and Halliday settled into a good rhythm. 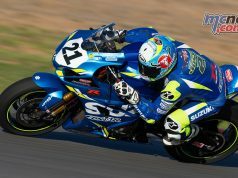 Stauffer looked impressive early, and on the second lap of the race he posted a super quick lap time of 1:31.277 to post a new Superbike lap record at Eastern Creek. Maxwell had been bumped down to seventh position after three laps, but within a couple of laps he had regained to places to be up to fifth. Allerton continued his good race by passing Halliday and moving into second place past with only four laps remaining, at which point Jones made his move. Jones moved into third place on the seventh lap with some strong passes to work his way past Herfoss and then Halliday, before getting ahead of Allerton and into second shortly after. With two laps remaining a red flag drew an early conclusion to the opening race leaving Stauffer to claim an impressive race win ahead of Jones, Allerton and Halliday. Herfoss and Maxwell finished in fifth and sixth places respectively. Race two began like the first with Stauffer taking a commanding early lead, and he was followed by Herfoss, Halliday and Jones. On the second lap a mistake from Herfoss pushed him back down to fifth, while Jones continued his impressive showing by moving into second. 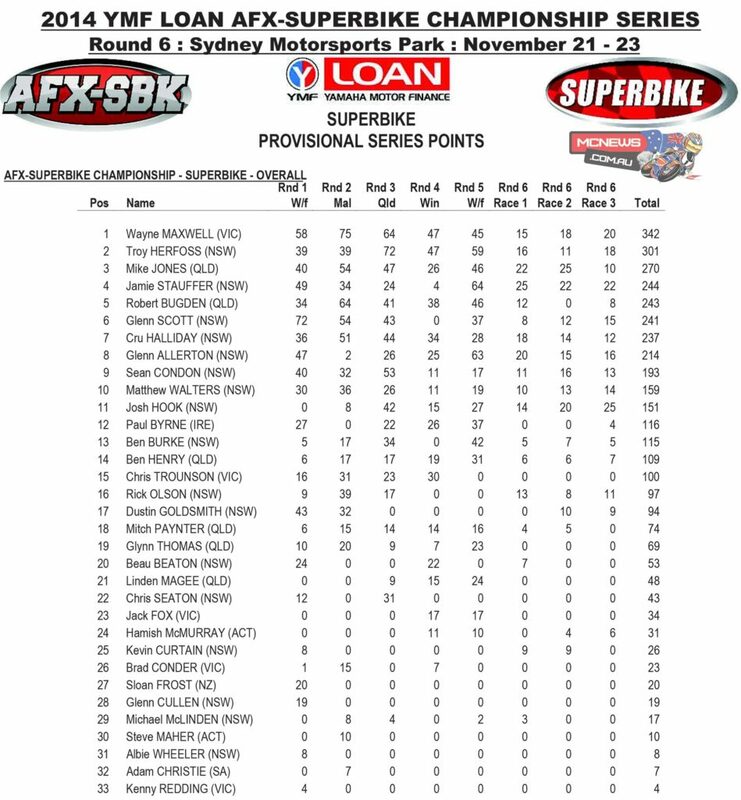 Maxwell settled into the race back in sixth, while Allerton pushed into third on the third lap. By the end of lap four, Jones had whittled Stauffer’s lead down to well under a second, and at the halfway mark he passed him with exceptional speed coming down the home straight to take the lead. 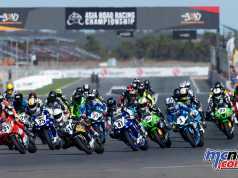 Josh Hook began to make his move as well – battling through the field in the opening half of the race to settle into third with just four laps to go. Allerton was heading in the other direction however – and drifted from third back into seventh – passed by Hook, Herfoss, Maxwell and then Sean Condon (Allerton eventually finished in sixth). Herfoss suffered issues on the final lap of the race falling back to 10th overall, and that allowed Maxwell to ride through and claim fourth, with Condon coming in fifth. 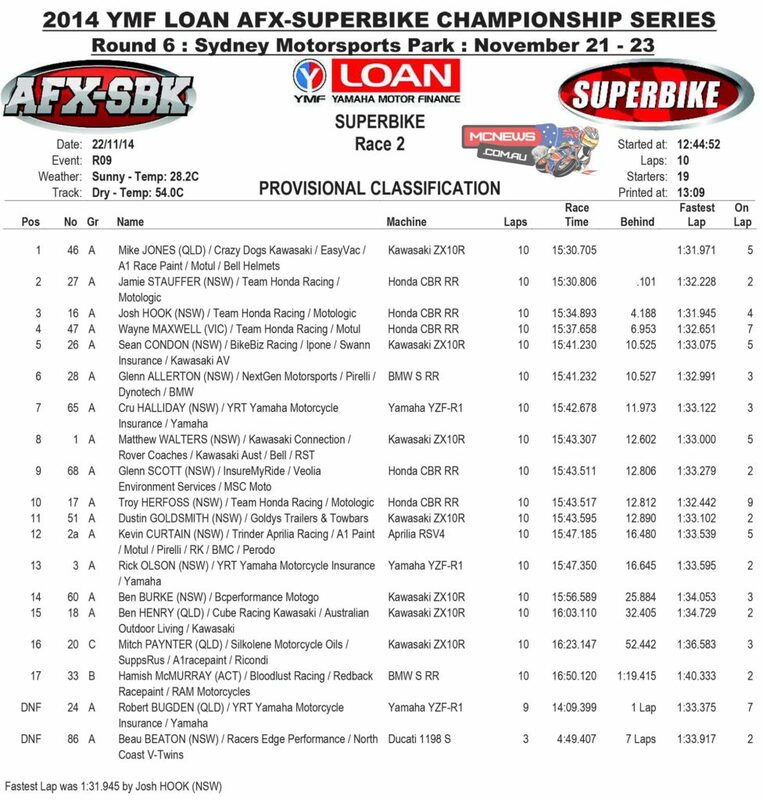 But ahead of them, Jones capped off a brilliantly engineered race to take his maiden Superbike race win, ahead of Stauffer and Hook. With the championship sewn up heading into the final race, eyes were on Maxwell to see just how much he had been holding back in the opening two races – in the pursuit of safe championship points. Coming off the start it was the Honda quartet leading the way, with Hook grabbing the early lead from Stauffer, Maxwell and Herfoss. It remained that way over the opening two laps, before lap three saw Stauffer pass Hook for the lead, and Herfoss pass Maxwell for a share of third place. Stauffer and Hook swapped positions up front a couple of times throughout the race, before a red flag due to a crash at turn one forced a temporary delay in proceedings. When the riders came back out, the second part of the race was scheduled as a four-lap affair, and it was again Hook who made his way to the front from Maxwell, Herfoss and Allerton. Allerton soon edged past Herfoss into third place and at the finish line he pipped past Maxwell into second. Hook held on to take the win in the second part of the race, and when combining results with part one, the youngest of the Honda crew held on for the combined race win. Stauffers’ combined results gave him second place in the race, with Maxwell and Herfoss finishing in third and fourth.